Cousins! What a sweet memory! 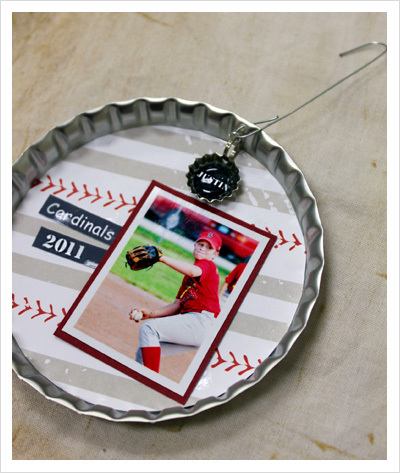 Make a photo ornament to remember your child's sports accomplishments from that year. It will become a cherished ornament to take out each year and feel proud to put on the tree. Super jumbo Christmas images from Daisy K! FREE when you buy the Super Jumbo or Jumbo Cap Ornament Package. Oversize bottle caps are a great way to frame stitched or embroidered designs. 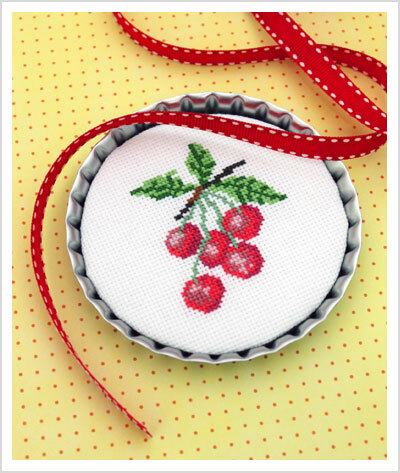 Showcase your beautiful stitchery on the tree or around the house to add some Christmas cheer. 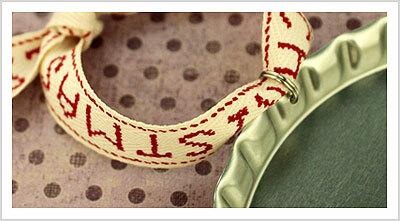 Make your family feel loved by stitching a circular monogram or name tag to hang beside their stockings. 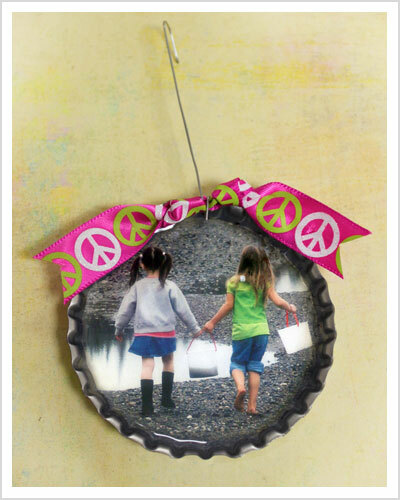 Create a Keepsake Photo Christmas Ornament! 3-1/2 inches of space to scrap with your favorite photos inside. Plenty of space!! Leave it as is or seal it with Mod Podge or 3D Crystal Lacquer. Just remember, if you are using a sealer, play it safe and have your photos printed or copied on a laser printer or copier. Sometimes sealers can ruin ink jet and lab printed photos. 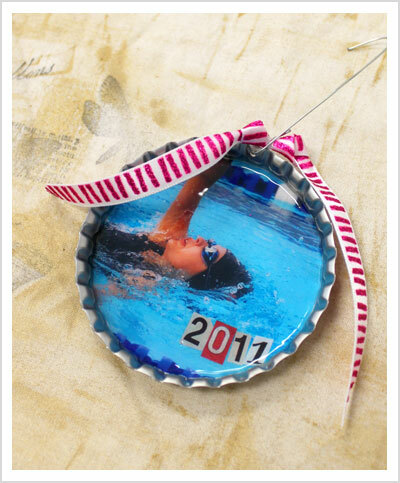 Add a mini cap charm to personalize the ornament even more. More scrap ideas! 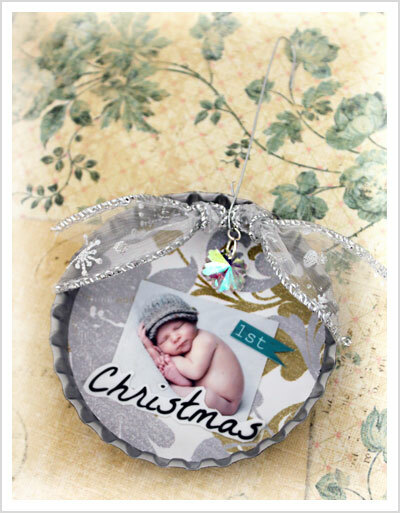 What a great way to remember your baby's first Christmas or any timeless memory. Add a bead charm! Oversize Bottle Caps have lots of space to create in! Jumbo 1-3/4", Super Jumbo 2-3/4" and Super Duper Jumbo 3-1/2" in diameter. Another super jumbo cap pendant and ribbon idea. 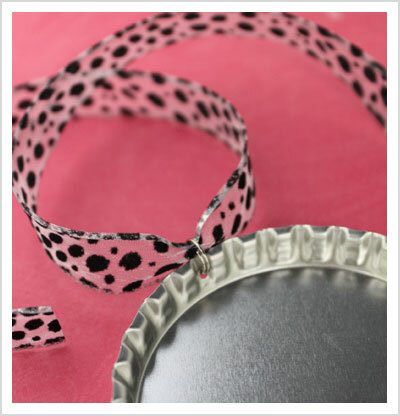 Craft stores usually offer lots of different kinds of ribbon that are inexpensive and so fun to coordinate with your personal style and home decor. The ribbon spools I bought were each under $2 for about 3 yards. Lots of fun!! 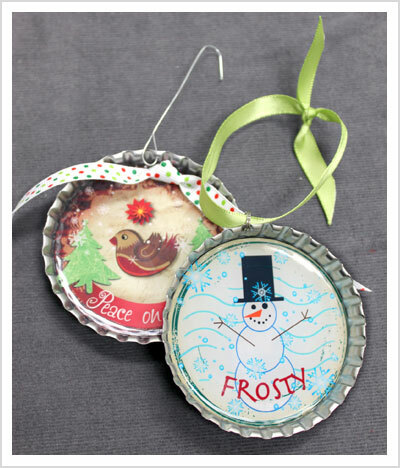 Here's a really fun, easy Christmas Kid's Craft! Collect all kinds of craft items, magazines, papers and found objects from around the house and let 'em fill up their caps. Seal it up by filling the cap with 3D Crystal Lacquer. They'll love it! Do you think it would work to apply mod podge over the inkjet or pictures and allowing it to dry before applying the laquer to keep the image from bleeding. I have not done it. Just getting started with bottle cap crafts so lots to learn! I was just thinking it was kind of like a sealer and maybe it would help. Tanya, I have tried Mod Podge with my ink jet printed images and it worked to seal the image before using 3D Crystal Lacquer but the mod podge blurred the image so I didn't have any success. I don't know if that's true of all ink jet prints and Mod Podge. I used an HP Photosmart D7160. Cindy, in my experience you do have to be very careful how thick you apply the Mod Podge or it will dry cloudy. 3D Crystal Lacquer works great with the laser prints I've used and you can apply it as thick as you want. It will dry clear. I saw where someone used embossing powder and then baked it in the oven. I would like to be able to put charms in them and that wont work for charms that aren't metal. I like that the 3D Crysstal Lacquer doesn't have harmful vapors but the printer we have is a Lexmark inkjet. 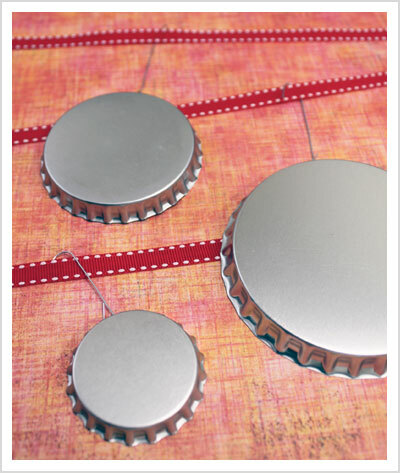 I gave Bottle Cap Co a shout out today from a blog post I did using your AWESOMELY STRONG magnets. http://bles-id.blogspot.com/2012/01/magnet-mania.html Thanks for your great products, you guys rock!!! I have an issue with what looks like rust seeping through the sides after a period of drying. I''ve had success sealing jumbo bottle cap with glamour seal first before gluing image down and sealing image with glamour seal before glazing. Image comes out crystal clear, but haven't been able to completely resolve the problem of rust seeping through the sides. Cheryl, I’m sorry about the problem you’ve had with rust. We haven’t experienced this problem in the past with our bottle caps. They are factory sealed but would rust over time if they were exposed to water. We would be happy to send you some replacement caps. Thank you for shopping with Bottle Cap Co. Thank You for responding to my comment. 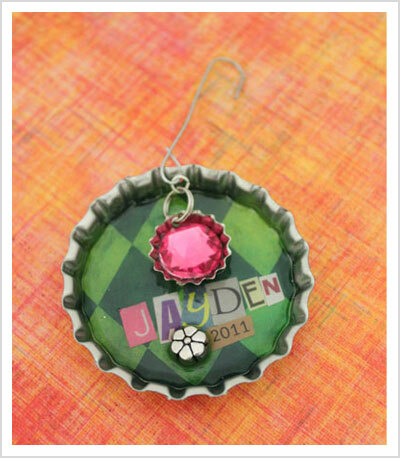 I order these in bulk and have had great success with the bottle cap ornaments I make and sell at craft fairs. I am a perfectionist and have been trying to resolve this problem that appears from time to time. I'm not sure if it's a reaction from the ink and the glaze, or the cap and the glaze. I've thrown away many caps because of this problem and would appreciate as many replacement caps as you're willing to send. I'm sure I will be ordering again before this craft season ends. I'm continuing to try different methods. It doesn't make sense because I haven't had a problem for awhile. It may be the humidity as we've been getting a lot or rain the pats few weeks. I'm hoping to resolve this issue once and for all. I bought a jug of bottle caps with corks. Some still have the corks. Some have been peeled and show playing cards (ace of spades , etc). How do I find out their value? Cathy, you might want to take them to an antique shop and see if they know.